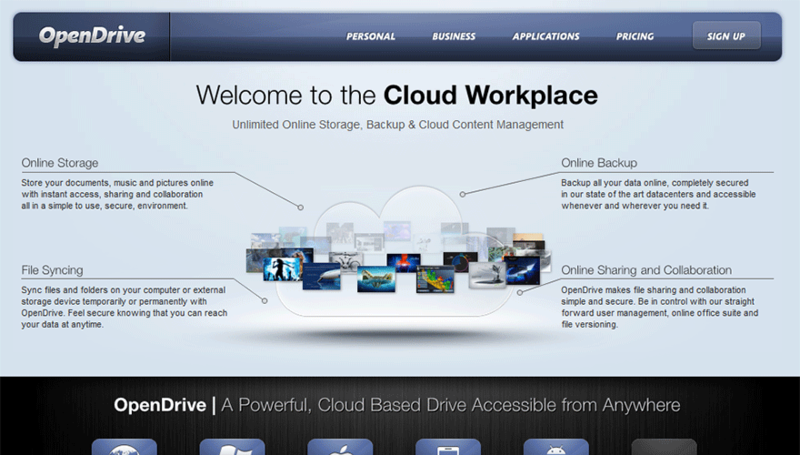 OpenDrive is an Internet cloud-based online backup company that was founded in 2008 and based out of Palo Alto, California. They currently serve well over one million users and is currently trusted by over 20,000 businesses worldwide. OpenDrive allows unlimited backup for both Personal and Business plans which includes unlimited stoage, file size and transfers. A reduced cost plan starting at $6 offers customizable options for those on a budget. They offer continuous backup and sync and online editing of documents. For free users, you will be limited to 200 KB/s transfer speeds, 100MB maximum file size and no file encryption but they do offer a decent 5GB of storage. OpenDrive offers everything you will need to make backups of your computer and important files. For those that prefer to backup specific files, you can take advantage of their web-based platform that allows easy drag and drop to store them on your account. The web access is a great feature for those on the go that don’t wish to have additional software running on their computer. OpenDrive supports virtually any file type you can think of including documents, video, music, photos and many others. Want to edit a document? No problem. Access the file in the cloud, make changes and then take advantage of the many applications available to synchronize and update your local files. That means you can make edits to files on your Android and the local desktop file will get updated once you synchronize. OpenDrive for Windows & OpenDrive for Mac: Both applications are made available to download free of charge. The advantage of these applications is you will be able to easily synchronize, backup and store your files across multiple users and computers through a virtual drive right on the desktop. You’ll basically have a new drive letter with up to 5GB of storage before needing to pay monthly to access 500GB-Unlimited storage depending on the plan you choose. 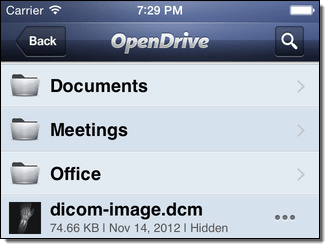 OpenDrive for iPhone: Allows you to access your files right from your iPhone including the ability to stream music and videos, save photos and share files. The downside is most user reviews at the App store are low complaining of usability problems and UI related issues. OpenDrive for Android: Allows the same thing as the iPhone app including file accessing, editing and streaming. User reviews for their app on the Google Play store are trending negative with users complaining of crashing, connection problems and feature requests. For the majority of the available methods you can use to back up your data, you’ll have access to 128-bit security with AES-256 bit security available on premium plans. Based on our evaluation, we’ve determined that a majority of focus on OpenDrive was placed on the web and desktop versions of their software. These options include a really nice photo album viewer with image preview, image editing and even sorting of images. Want to listen to your music? Click the music tab and you will be presented with all music on your account that gives full music controls. Custom Branding: Take advantage of this feature that is only available on the business plan to add your custom branding to any files you share to your partners or customers. You can add a logo, custom drive name and map the hosting to your own domain name if you need. Powerful User Management: Create and manage multiple account users with folder access restrictions, storage controls, bandwidth allocations from a centralized console. 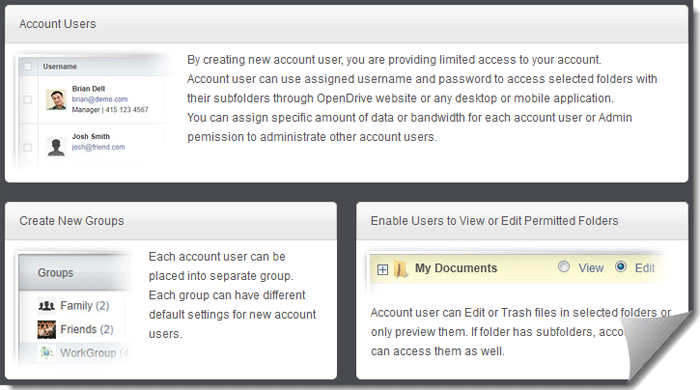 Depending on the size of your business, you may need groups to allow user sorting and OpenDrive has that option as well, including the ability to apply permissions to all members in the group. The user management features include the ability to allow specific users access to view specific folders on your backup drive. You will also be able to control who can edit or delete files in selected folders if needed. Lastly, you’ll have access to a full audit trail that allows you to see all user activity including usage reports, logins, downloads, uploads and more. The problem with users though is you won’t have access to additional users on your account without paying an additional fee of $9.95 per user (1st user included). IP Management: Besides password / account security, you will also have the ability to block access to the backup drive according to IP address. If you want to make your files accessible only to employees on your local business network, you can do it by setting up an IP range that only your network uses. This online backup service offers their solution in a N+1 maximum security data center in the Silicon Valley with constant monitoring and surveillance. For those that subscribe to a premium account, your data will be mirrored to multiple servers for enhanced redundancy. Besides the Windows / Mac software, you also have the option to go software free and have seamless integration with your Windows Explorer or Mac viewer. This is known as WebDAV and easy instructions are provided that allows you to map a network drive to your OpenDrive account. Once that is configured, you can click and drag files to your newly mapped drive and the files will save right to OpenDrive over the cloud and will work just like any other hard drive on your computer. Accidentally delete a file? 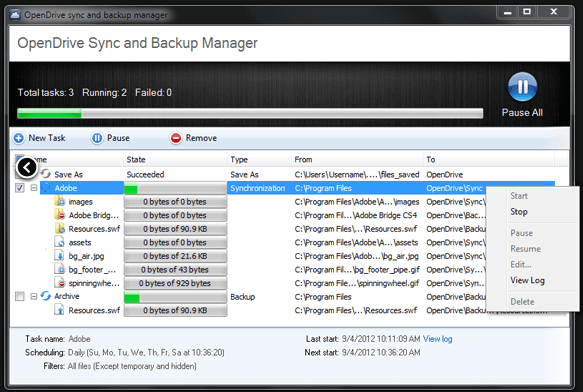 This wouldn’t be a good backup solution if that file is also deleted from your online backup account. Head over to the trash folder and recover deleted files painlessly and quickly. Did you delete a folder with thousands of files? No problem, download a zip file of the entire trash folder and restore it that way. We’ve touched on the pricing throughout this review, however, this section provides a full breakdown of their pricing plans and options. We enjoyed the fact that all of the pricing is available right on their website and is completely transparent to you, the user. If you want to offer access to users in your account, you can do so for $9.95 per month. The Personal Unlimited account allows you to create up to 3 users on the account with the first user included in the plan. 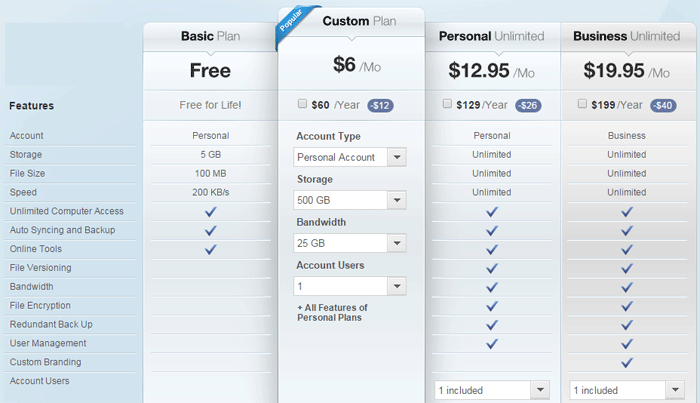 If you need more users than that, you can upgrade to the Business Unlimited plan which allows 1,000 users. Interested in the Custom Plan? Be sure to visit OpenDrive with the button below and click the pricing option. You’ll have the choice between Personal or Business, 500GB – 100TB space, 25GB – 5TB bandwidth and up to 1,000 users. Prices vary and update live right on the page depending on the options you choose. How has your experience been with OpenDrive? Leave a comment below and let us know!